Day 20. 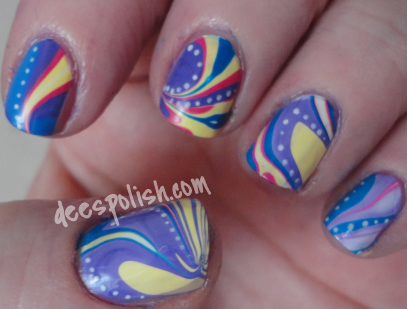 My nightmare nails: water marble. Did I pull it off? Ok, I know these water marble nails will not be winning any awards, but for me? Phenomenal! I used FxFS White Matter as my base.. then I used a combo of FxFS Eureka, Omni & Indelible along with China Glaze Lemon Fizz.. and then added some white dots with China Glaze White On White. Now we are getting in to the zone that usually ends my quest to finish the 31 day challenge.. but I am not throwing in the towel this time, I swear! Let's see what happens now..
31Dc2014 - Day 18 - Half Moons + 500th Post! !